I went to a local park with my husband late yesterday afternoon. He’s continuing to recover from his surgery and is becoming more and more active, so he wandered around the park listening to a podcast while I took some photos. 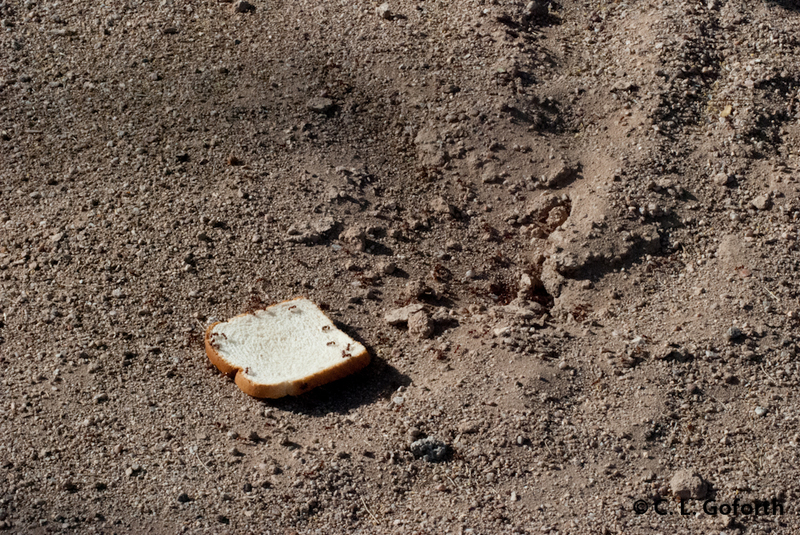 While we were there, I observed several insects flying about in the warm air. Today I’m going to share five behaviors I saw during the 30 minutes we spent along the pond at the park! WARNING: I didn’t think to check my camera settings before I started shooting today, so I took all of my shots at 1600 ISO. My camera starts to get noticeable grain at 400 ISO, so today’s photos are going to be, well, rather cruddy. Won’t be making the mistake of forgetting to check the ISO setting again though! Damselfly on lee side. It's halfway up that yellowy-brown cattail leaf, in case you're not finding it. Told you the photos from today were awful! Yesterday was rather windy. Damselflies don’t fly well in strong winds and I’ve observed them doing one thing over and over again in high wind conditions like I saw yesterday: they fly around to the sheltered side of the vegetation rather than continuing to fly in the wind. Perhaps they’re moving to the sheltered side hoping to wait out the wind or maybe they’re just optimizing their hunting by finding a place they can fly reasonably well – I don’t know. But, they seem to either hunker down in the vegetation or move around to the lee side and continue on with their business. 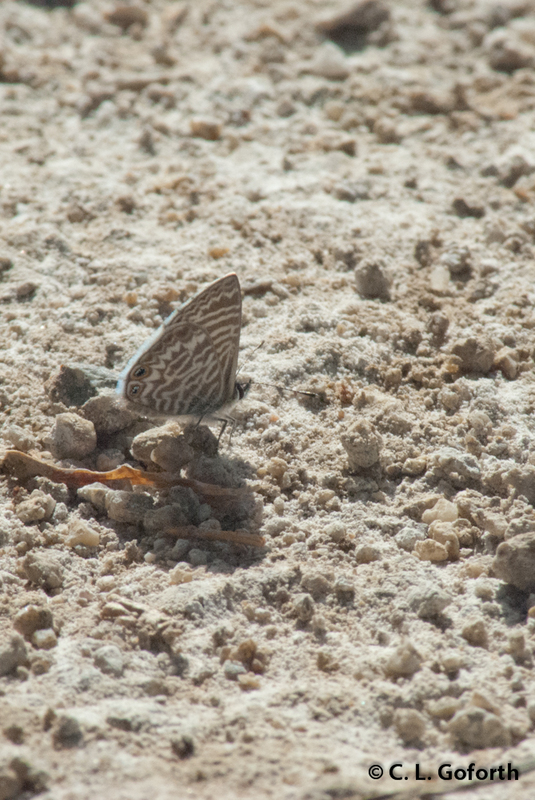 Considering my interest in odonate responses to changes in weather, I find this behavior fascinating! Patroller, that blur indicated by the arrow. I only saw a handful of dragonflies (probably due to the wind), but there was one impressively large darner (blue-eyed darner I think, though it was quite far away) flying back and forth along the stream between the spring outfall and the pond. It flew by several times as I watched, mostly in the shade of the palm trees. 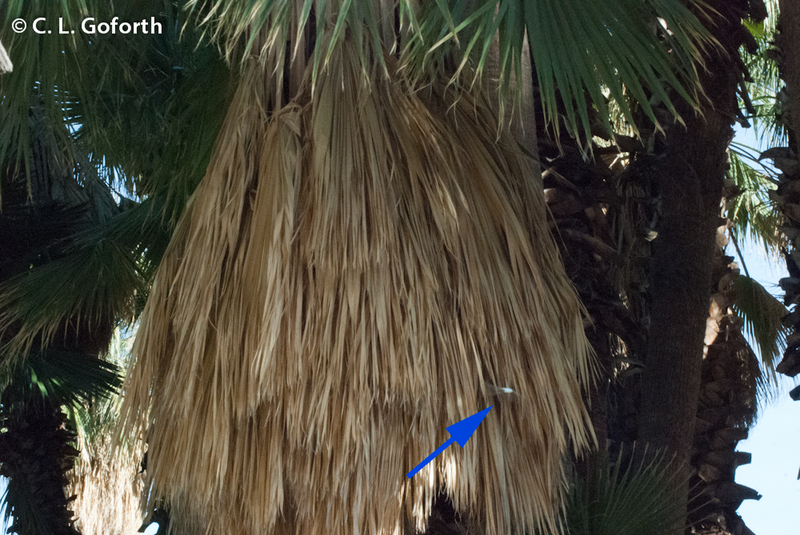 It was definitely doing some hunting because I saw it chase several small flies up into the “beards” of the palm trees, as is sort of evident from the photo above. Wow do the darners fly well! It’s always a treat for me to watch them! Several insects are known to form mating swarms. Often they’re made up of male insects swirling about in a column in the air, competing for the best position. When a female flies into the swarm, several males will try to grab her first, but only one will be successful. I was at the park just before the photographic magic hour, so it was very apparent that there was some serious fly nookie happening at the pond! With the great backlighting I saw several mating swarms around the park: over the water, over the grass, over the trees. I couldn’t even begin to tell you what kinds of flies they were (best description I can give is “small!”), but they were fun to watch. It’s not really within the realm of entomology, but there was some interesting fish nesting behaviors happening at the pond today too. Several fish had these little round depressions in the pond bed that they were guarding from the other fish. Really fun to watch, so I feel I should mention it too. All in all, another fun day of wildlife sighting (if not a great day for photography)! 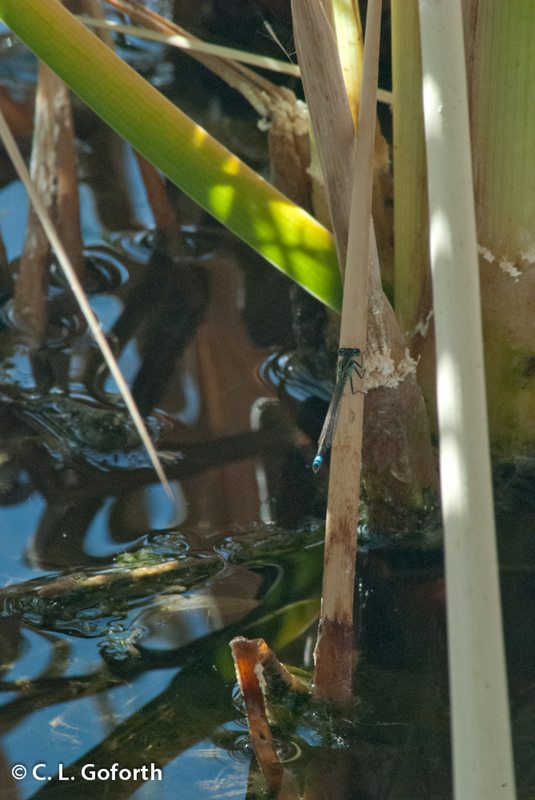 Love the first photo, it took me a while to spot the damselfly. That’s why I provided directions in the caption! I only knew it was there because I watched it fly there.